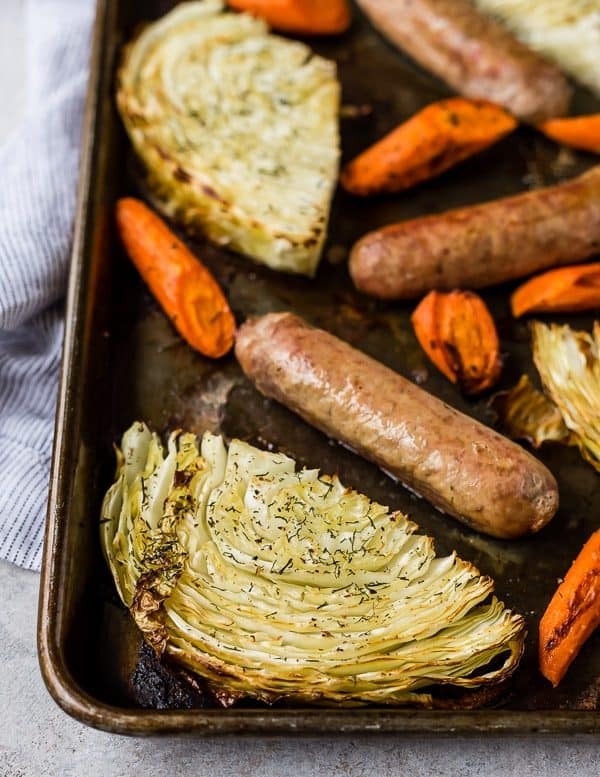 This Sausage Sheet Pan Dinner with Cabbage and Carrots is an easy and delicious meal, made on one pan in about 45 minutes. 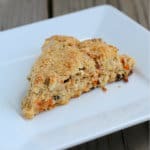 You’re going to love it for busy weeknights! School meetings, recess duty, field trips, volunteering in the classroom, etc. I should just ride the bus to school with them, I feel like I’m always there! Then when I’m home, there’s always housework to do and this and that and getting ready to have people over, etc. etc. etc. I think once he’s going five days a week, I might be able to get into more of a routine, but honestly I’m not really holding my breath for that! Also it’s a little ridiculous how much I miss them while they’re at school so I’m not in a giant hurry to get to the five day schedule. Then of course Ben’s hours are as crazy as always and to be honest, when dinner rolls around, I’m tired! An easy recipe that doesn’t make many dishes dirty is always appreciated. I’m not a consistent meal planner (I wish I was better at it) but I often will pick up turkey Italian sausage from the store because I know there’s so much I can do with it. 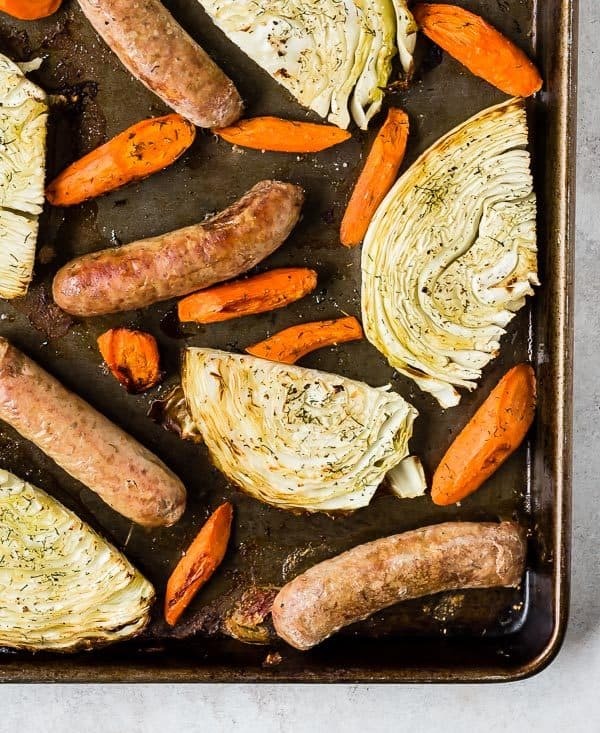 We can keep things straightforward and grill it, or I can make a sheet pan dinner with it like this recipe with cabbage or this roasted Italian sausage with whatever vegetables I have on hand. Or, I can take it out of the casing for endless options. Whether I’m craving a cozy turkey sausage stew with white beans, or a quick Instant Pot pasta recipe, I can make it happen all with this one versatile (and healthy!) ingredient. 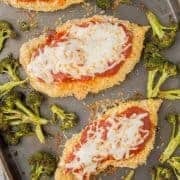 This is a super easy dinner that you can make with any vegetables you have on hand. You could also add potatoes if you want…if you’re a meat and potatoes type of person. 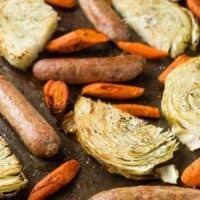 I like the fresh flavor that the dill adds, but you could also try this with a sprinkle or oregano or basil, especially if you’re using Italian sausage. I hope this makes your crazy weeknights a little bit easier! 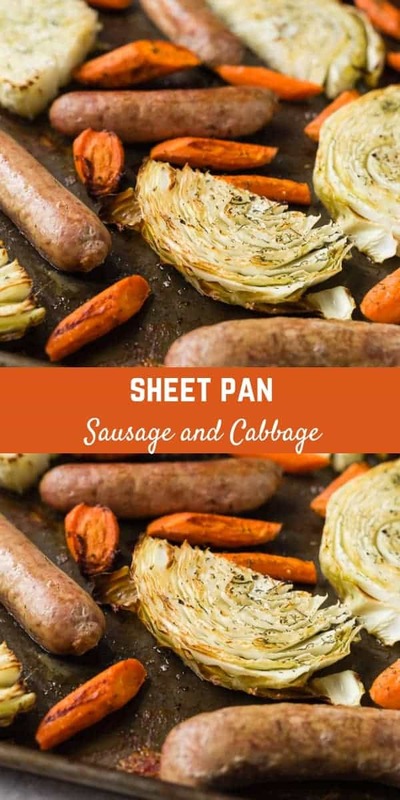 This Sausage Sheet Pan Dinner with Cabbage and Carrots is an easy and delicious meal, made on one pan in about 45 minutes. You're going to love it for busy weeknights! Remove core of cabbage and cut into 1-inch slices. 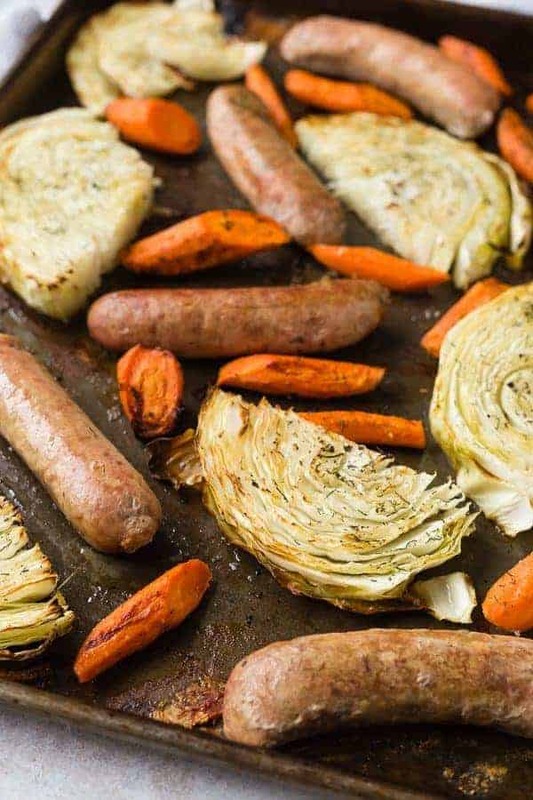 Arrange cabbage and carrots on sheet pan and drizzle with olive oil. Sprinkle with salt, pepper, and dill and use your hands to coat the vegetables with oil (it doesn’t have to be perfect!). 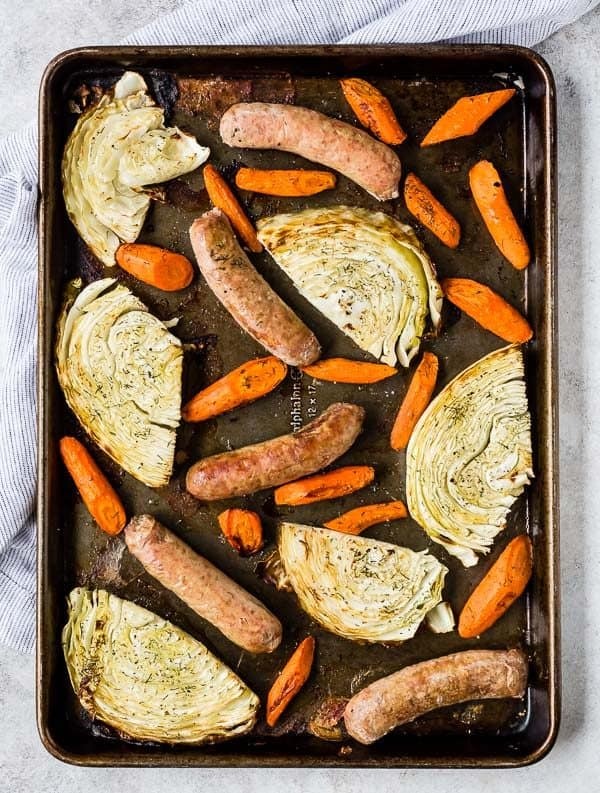 Arrange sausage on sheet pan. 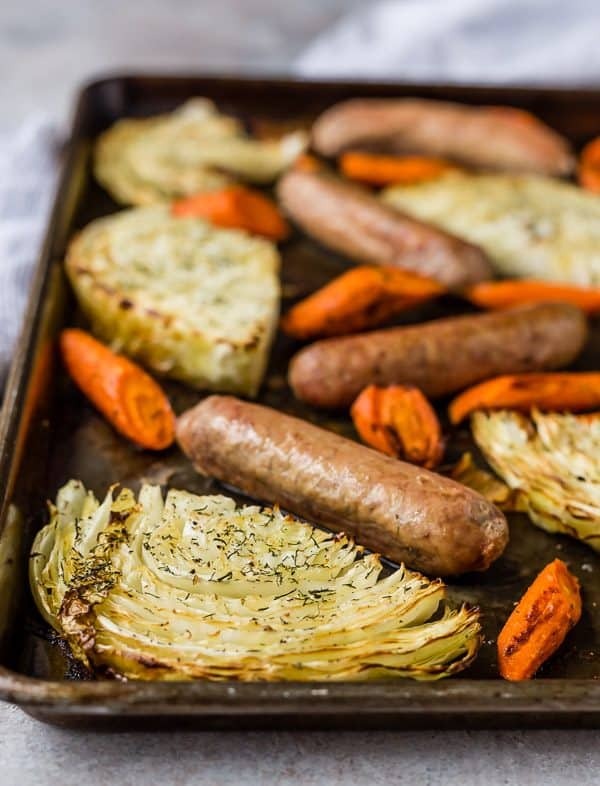 Bake for 20 minutes, remove from oven and stir carrots and turn sausage. Return to oven and continue to bake for 10-15 minutes or until carrots are tender and sausage is cooked through (165°F internal temperature). Note: Make sure to choose a raw sausage rather than a precooked sausage. If using precooked sausage, add halfway through cooking time. Verdict: I loved this quick and easy meal. Husband’s take: Ben’s not a big cabbage fan, but other than that, he loves this recipe. 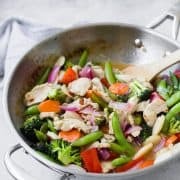 Changes I would make: None are necessary, but you can easily substitute different vegetables – just use what you have on hand.